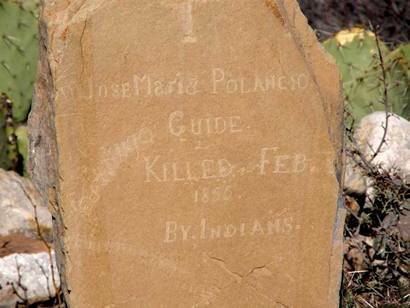 Finding the Polancio Grave Marker. Just how good is a forty year old memory? Oh, has anybody seen my car keys? Years ago (Can I say 1967?) 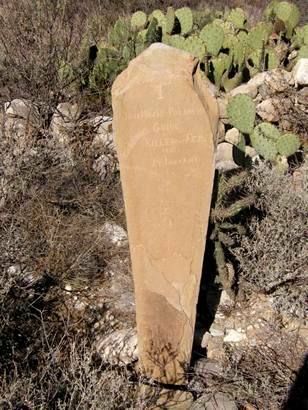 I visited and photographed a crude grave marker near El Capitan, the peak between Carlsbad, NM, and El Paso, TX. 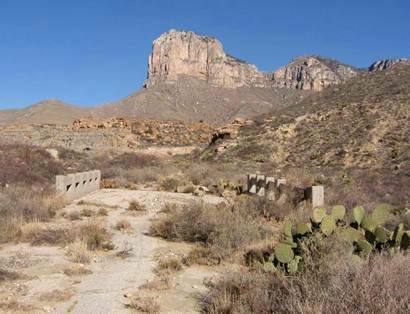 The road on which the marker was located was bypassed in about 1962 with a new roadway that had much shallower inclines. Having driven past the old road literally hundreds of times in the forty plus years since, I began to wonder if the old marker still existed. I spoke with several people who might know and was assured that it, indeed, was still there. Thus began a series of events that eventually lead to my re-locating the marker a few days ago. "I came to an old bridge and began looking for the marker." Back in November, 2009, my friend Gerald visited me from Shreveport, LA. 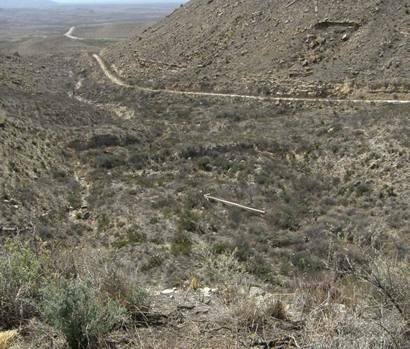 He was in Carlsbad for several days and we explored much of southeastern New Mexico and bordering Texas. We went up to the Queen area, the Carlsbad Caverns, Salt Flat and around El Capitan. I told him about the grave and so we stopped where the old road crosses the new. Gerald didn't think it would be smart for him to do much hiking so I walked down the old roadway to see if I could find the marker. 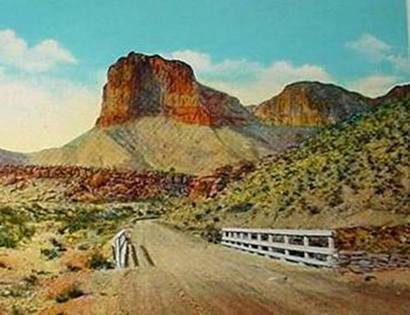 I had a vivid memory that it was right beside the road on the north side. I came to an old bridge and began looking for the marker down past it, going south. I went down quite a ways but found nothing. I took a lot of pictures where I thought the marker was. Nothing. I had mentioned to my friend, Boz, about wanting to find the grave and to climb up to the old road side park which was also bypassed when the 'new' road was built in the early 60s. He said he would like to go with me when he could find time to get time off work for a day trip. We had first planned to go on January 28th. That was the day we had a 6 inch snow. The road through the area of the peak often has to be closed for a short time due to high winds and bad weather. You don't want to be caught in this area during a snow storm. I still wanted to go but Boz canceled on me. A wise move. During this time I inquired some more about the exact location of the marker. 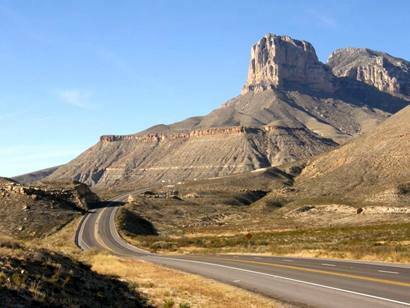 One person who knows the Guadalupe Mountains well said that it was visible from the road. I am sure she added, "You can't miss it." Another friend who used to be a Ranger for the Park Service said that when the road was put in, the road fill almost covered the marker. He said it was before you get to the old bridge. I had thought it was past the bridge. With that new information, my friend Boz and I set out with great expectation on our exciting discovery trip. The next time he could get off from work was last Thursday, March 18. 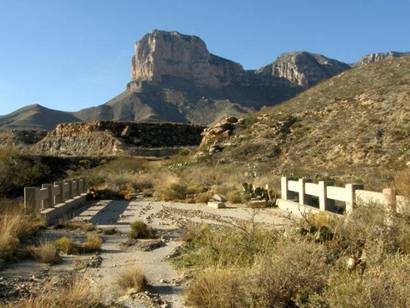 This is a perfect time of year to be in the Guadalupes, not too hot and not too cold. We got to the area about 8:30AM and climbed up to the old road side park, quite a feat in itself for us old guys. We spent some time there resting and enjoying the view. We took a lot of pictures before descending back to the highway. We then walked across the roadway and looked down where the marker was below. We used binoculars to scan the whole area paying close attention right near the edge of the road fill. The roadway was a huge construction project and the fill at this point is probably 60-70 feet high so that the fill area extended quite a ways out into the wash below. No marker found. "We walked to the old bridge and then went cross country..."
We then drove on down to where Gerald and I parked last November. We walked to the old bridge and then went cross country over near the road fill. We looked all over and there was no marker anywhere near the edge of the fill. Boz got up ahead of me and kept using the binoculars to look around. I surveyed all over. We were way off from the old road and I knew the marker was back much closer to it. In my head I went over all the conversations again. Did she actually say you could see it from the NEW road. Could she have been agreeing with me that it was near the old road as I remembered it was. Did he say the fill was from the NEW road. There was fill on the old road but not more that 6-8 feet. I told Boz that we were in the wrong area and we would find the marker on the south side of the road before reaching the old bridge. I didn't want to go back and leave Boz out there by himself. 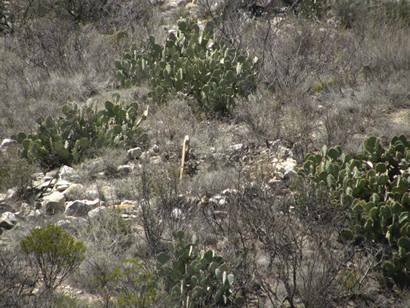 We weren't in rattlesnake season but it was warm enough for them to begin to move around. He wanted to look a little more but it just wasn't there. Just as I got to where he was near the fill, he turned and said, "There it is!" 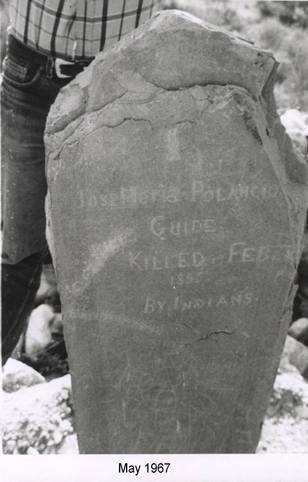 I took one look and knew right away that he had found the Juan Maria Polancio Grave Stone. It was tall and narrow made of a yellowish sandstone, but it wasn't anywhere near the road fill. But then it wasn't anywhere near the old road, either. 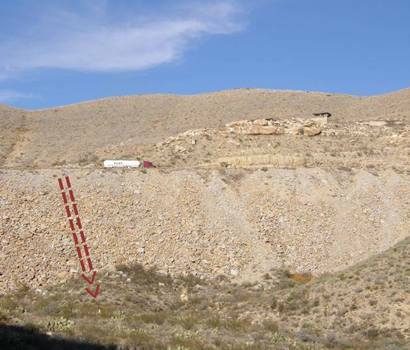 It was out in the middle of nowhere and, because of the gullies and outcroppings, was not visible from a distance in any direction. The marker is exactly in the same condition it was when I took the picture back in 1967. Only one vandal's initial has been added since then. I asked myself if it could have been moved. 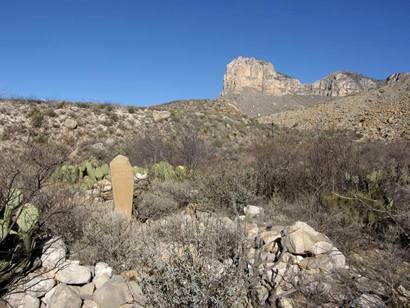 There is no indication that the marker hasn't been there for 155 years. In these photographs, if you use your imagination, you can see a crude circular enclosure around the marker. "Turns out that one of the pictures I took last November actually has the marker in it." Memory: I just can't imagine my hiking in such unfriendly territory just to see a hand made rock grave stone. You aren't going to come across it accidentally and how did I ever find it? Whom was I with? Maybe I was with my friend Mike who lives in Marfa. Maybe he can help fill in some of the blanks in the story. Granted, I was only at the marker once. The only reason I even remember at all is that I took and kept that picture. Who is standing behind it? Mike or myself? Why didn't I include the peak in the background? That would have been a big help. Turns out that one of the pictures I took last November actually has the marker in it. Being edge on it looks more like a fence post. 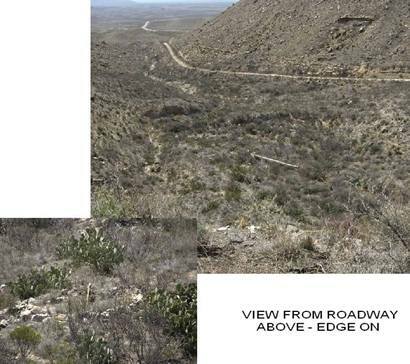 The marker is visible from the roadway above but, again, being edge on, it is nearly invisible. How credible are historical eyewitness accounts of an unimportant event? Don't ask me.